I was flying with my one year old daughter from Europe to India; she had terrible ear ache and intolerable pain while flying. Crying a lot disturbed co passengers and I felt very embarrassed, we are going back to UK after one month, what precaution I should take? Good you asked, I write this as I am having so many similar complaints from many â€˜Flying kids” and their mothers. This probably happened to your daughter because she had cold while flying, during ascent and descent, the pressure changes in the ear. This is called barotraumas and it is fiercely painful. 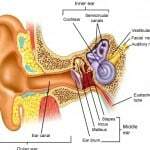 Explaining further, there is this Eustachian tube is a small vent, situated between the middle ear chamber and the back of the nose. If that small tube is blocked by congestion, the middle ear becomes an enclosed air space. As altitude increases the cabin pressure decreases. 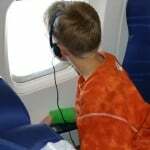 With the decrease in cabin pressure, the volume of air in the enclosed middle ear space increases. The ear drum, rich with nerve ending, screams with unrelenting intensity. Feed the kids during take-off and landing. Breast or bottle-feeding during take-off and landing will help alleviate any ear popping, as the sucking and swallowing action relieves pressure that builds up in the ears during this time. Straws in cartons of drinks would work the same way with toddlers. Putting cotton wool in the ear has no use. When the ear is partially blocked, kids feel the pressure, a crackle and a pop. Older children, ask them to squeeze their nose and swallow, chew gum, yawn or blow the nose hard. All of these tricks wiggle the opening of the Eustachian tube and allows the pressurized air to escape from the middle ear chamber. Flying with acute rhinitis (cold-flu) should be avoided if possible. If flying cannot be avoided, give a dose of a painkiller (Paracetamol) at least 30 minutes prior to take-off and landing. The use of decongestants is a must and I strongly recommend it for small children. Paracetamol with deconstants syrups are available. Nasal decongestant drops should be used 30 mnts before take off and landing. Occasionally, the barotraumas can be quite severe and the ear drum can actually rupture causing bleeding. But don\’t get panic; see an ENT doctor when you arrive at your destination. Have a safe painless journey next time.